Orders are being accepted now for the new book “Champions Together” — the official account of the Giants’ latest World Series championship season, published by the front office just for their own fans. These are $40 limited editions that will disappear soon and won’t be available in bookstores or Amazon. This hardcover collectible is filled with images taken by the Giants team photographers, already well-known within the MLB.com Blogs community for their incredible shots, and it goes from Opening Day through the third victory parade in a five-year run. Manager Bruce Bochy wrote the Foreword, and the last pitcher to win an official game in 2014, Jeremy Affeldt, provides the Introduction. You’ll also get a special Roger Angell profile of Madison Bumgarner. Click here to order yours while they last. Umpires are a vital part of the game. They lay down the law and instill order on the field. They keep the peace and pull the bodies out of the pile when mayhem ensues. Without them, chaos would overtake the game. Umpires could almost be considered the third team on the field, and if watched closely have their own game going on as well. The men in black are an underappreciated bunch at best and are the only ones that have to be perfect when they start their careers and improve from there. 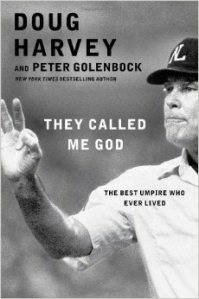 Today’s book looks at a Hall of Fame Umpiring career.